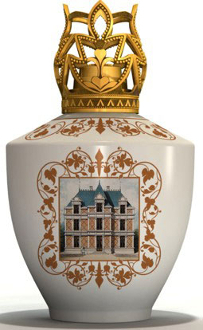 The Chateau lamp joins Lampe Berger's proud tradition (since 1898) of making the most unique and beautiful catalytic fragrance lamps ever produced. Lampe Berger collectors will want to have this lamp-- it is simply exquisite! The snuffer cap in the photograph is matte gold; this actual lamp comes in a bright gold cap of the same design. The Chateau is shipped in a nice Lampe Berger gift box with burner, funnel and instructions. The slotted top is the standard heavy gold.